Chocolate Chip Cookie Dough Cheesecake Bar - BEST cheesecake bar EVER with chocolate chips, cookie dough and cheesecake, every bite is sinfully sweet! A special occasion calls for a special, sinfully good dessert recipe, and a special season like the holidays call for that extra sinful, to-die-for dessert that you just want to indulge, and this chocolate chip cookie dough cheesecake bar fits the bill. 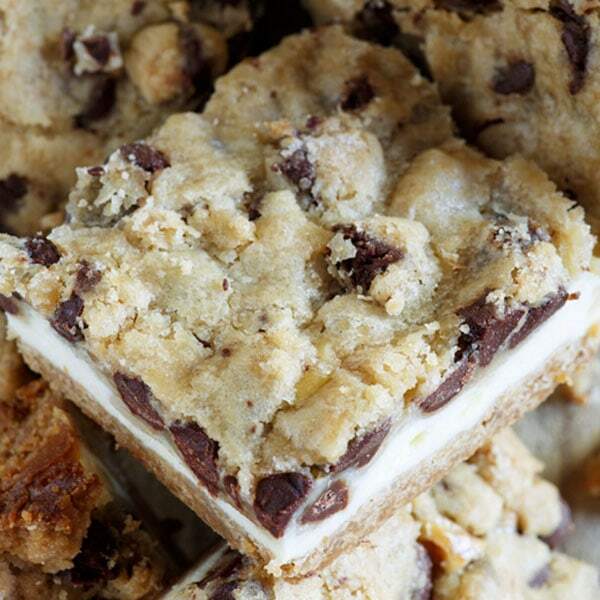 It’s the combination of two of the best desserts: cheesecake and chocolate chip cookie dough, the holy grail of cookie bar! This is a scrumptious treat that everyone loves and the sweet ending that everyone wants to indulge in and not have to feel guilty because it’s the holidays! The good thing about this killer dessert is that they are quite easy to bake. I love the flavors: the buttery cookie dough, the rich cheesecake, and the ever so pleasing chocolate chips in every bite. Chocolate Chip Cookie Dough Cheesecake Bar is rather similar to the very popular Brownie Butter Cake…basically you get the best of both worlds in one dessert recipe. This season, indulge in your sweet tooth and make this for your family and friends. You won’t regret it, I can assure you. Hi Bee, will the cookie dough sink into the cheescake batter when it’s dustributed onto the top? Oh these look like a great idea for Christmas giveaways (for friends, unless you want to send me some to Bulgaria, hehe) instead of the traditional cookie. This recipe was very yummy! Easy to make. Family and Friends loved it! Thanks! These were great! I made them and then took them to church and they were a hit! Everyone loved them! These were very yummy. I’m going to try your sweet & sour pork recipe next. Made these for Thanksgiving. They were so good and a hit! Would definitely make again! Thanks Lisa for making this chocolate chip cookie dough cheesecake bar!! Tried this but must have made a mistake somewhere. The chocolate chip cookie dough never came together as a dough for me. I even added more butter. Should have added an egg maybe. Maybe I grabbed the one cup measuring cup by mistake when I measured out the flour. It was extremely dry. I spread it over the cream cheese layer with the hopes it would hold together after baking, but no such luck. Oh well. I’m sure my younger brother-in-laws will eat it anyway and enjoy it. I was expecting the same problem, my cookie dough was very dry as well, but once I “fisted it” together as the recipe stated, it worked out. I think the cookie dough needs to be dry in order for it to not sink into the cheesecake. Sorry for your disappointment! are you missing an egg in your dough portion of your recipe? the “dough” was like crumbs not like a cookie dough? Hi Val – it’s supposed to be very dry. just made these after I saw them on pinterest!! I wish I could post a picture of what turned out like but I don’t know how… they look a lot like the picture though!! It did take a longish time to make, but I’m a beginner in baking, but overall it was really easy. It took me in total about 1.5 hours from making them to eating them, with baking time and cooling time included. Thank you so much for sharing this recipe, it will definitely become one of my usuals!!! Hi Sarah – thanks so much for trying this recipe with success. I would have loved to see your creation. Happy holidays! These were VERY good! My boys LOVED them. Next time I think I would use 1 stick of butter. The bottoms were crumbly. Otherwise great recipe. These brownies looked delish. I made them for my family and followed the recipe to a tea but they fell apart as I served them. Not sure what happend. Great flavor don’t know why they didn’t turn out quite right though. I would like to do a review on this recipe, I was wondering if I could bake with a premade cookie dough such as the Philsbury doughboy dough? I am making these right now but doubled the recipe and placed in a 13×9 pan. Do you think I should bake longer? I made this last night. It was great. But the only problem I had was the crush fell apart so it was very crumbly. Everything else stayed together. Any one has any ideas what I could do. I know I measured correctly. I was thinking of adding sugar. Any suggestions? i had same experience before… you have to press it properly until it firm than only bake the crust..i use digestive biscuits.. i did some experiment by adding 1/4 cup brown sugar and it turn great.. but you have to bake it within 10 minutes or less.. last but not lest dont forget to refrigerate overnite before serve.. I do NOT recommend using tinfoil. Graham cracker stuck to tinfoil. Cookie doughbis clumpy, since no egg is used. Once refrigerated cheescake and cookie dough stayed togwther. Graham crackwr still did not. Tastes good, however presentation is rather sloppy. I just made this, and I agree that an egg is missing from the cookie dough part. You won’t be able to “flatten the clumps of dough in your palms” without it, because it is too dry and crumbly. Adding an egg makes it perfect and delicious! cheese cake cheese cake…,,, wait me..
and I allways eat cheese cake withe a milk…hmmmm great shared admin :) Thanks..
wah, sedap nampaknye ni. izin cube lah ye kak.. mekaseh. one of the best recipe I’ve tried.. Thnk you so much.. I’m waiting for your new recipe! Omg they were so delicious!! Thanks for sharing this awesome recipe with us! May I know how Long you can Keep these for at room temp? OMG this is so delicious!! malaysia is the one of the best place for delicious cookies :) Congratulation!! I’m glad I checked these comments as I was concerned about no egg and the cookie dough feeling dry in the middle of making this recipe. I did make the clumps and everything came out perfect. I lined the pan with no-stick foil and sprayed the foil with Baker’s Joy and it came out easily. This was very sweet, but delicious – thanks! one of the best recipe I’ve tried.. Thnk you so much.. Can’t for your new recipe! Hi, do you have the exact measurements instead of those in cups?